I have seen various reports recently about the lack of diversity in children’s literature: from SavitaKalhan on this blog, and elsewhere from Malorie Blackman and Bali Rai. This is about what happened to me. My grandson is seven months old and the other day my daughter, Emily, asked me if I’d like to buy him his first book. ‘Yes!’ I thought, ‘That will be fun. Maybe I’ll get a board book copy of THE BABY’S CATALOGUE.’ It was my son’s first book too. He’s a few years younger than Emily and it hadn’t been published when she was born. In fact, Emily more or less grew up with the Ahlbergs. EACH PEACH PEAR PLUM was published the year she was born. 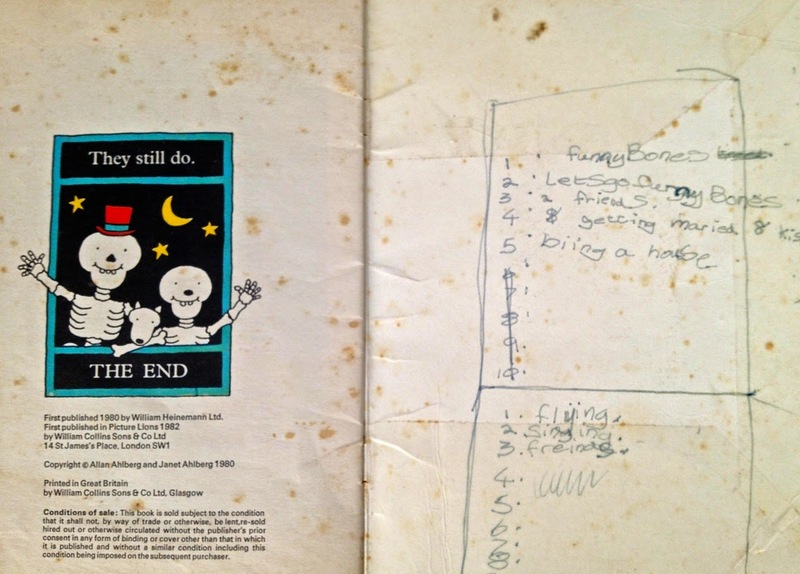 I even have her original copy of FUNNYBONES, in which, long before there were any sequels, she had penciled her own ideas for future books. For example: GETTING MARRIED AND KISSING and BIIING A HOUSE. You see how children engage with picture books? So,I took myself off to my local children’s bookshop. I should say at this point that while I am a white, grey-haired man, and my daughter is white with blue eyes and masses of curly blond hair, my son-in-law is black. Fallou, my grandson is a perfect, mid-brown mixture. On the way to the bookshop I wondered whether maybe THE BABY’S CATALOGUE would be a little old-fashioned. Then I started to remember that it was full of those wonderful pictures of all kinds of babies and all kinds of mums and dads. And I remembered all the fun we used to have looking at it, and how Tommy eventually destroyed it; used it up entirely, what with eating it and dragging it around. Sadly, when I went into the shop they didn’t have a copy, which was a shame. On the other hand I would enjoy looking through all those picture books for the first time in years, wouldn’t I? I was sure to find something good. I must have looked through twenty or thirty board books before it dawned on me - I hadn’t seen a single picture of a child who wasn’t white. At first I thought this must have been bad luck, so I kept looking. It wasn’t bad luck. The board books in this (very well-stocked) bookshop were almost all about white children or animals. I moved on from board books to picture books. It was the same thing. Sure, there were some books with black, brown, yellow children, but the others vastly outnumbered them. I found to my astonishment that I was starting to feel upset. I guess I’d assumed that in the fifteen years or so since I last looked seriously through the picture book shelves of a bookshop there would have been many more books like THE BABY’S CATALOGUE that depict children of every shape and colour routinely. I’d seen what Malorie Blackman had said, but there is no substitute for personal experience. I also know that for many of you reading this it’s already personal, and has been for far too long. And I feel embarrassed that it’s had to become personal for me to feel angry about it. I asked a member of staff about the situation. She very helpfully found me some books, among them THIS IS OUR HOUSE by Michael Rosen and Bob Graham and the CLAP HANDS series of board books by Helen Oxenbury, but the Michael Rosen was published in 2007 and the Helen Oxenbury in 1987. Other books I was shown included SO MUCH by Trish Cooke (1994) and books by Ezra Jack Keats, who died in 1983. They’re all terrific books, but we should be able to go to this year’s crop of picture books and find images in them that ALL our children and grandchildren can recognize and identify with. There are some, sure, but nowhere near enough. The world that is represented in a lot of picture booksdoesn’t seem to have changed much since the world of Judith Kerr’s THE TIGER WHO CAME TO TEA, whose café and Dad and street scenes come straight out of the 1950s England I grew up in. It looks absolutely nothing like Wood Green, where I live, or like Peckham, where my daughter lives, or Birmingham, Leeds, Newcastle or Liverpool. It doesn’t even look like provincial market towns and villages in the countryside. Not any more. I’m not sure where it is, this picture book world, but I can tell you that in most primary schools and nurseries in this country there are children who won’t find anyone who looks like them in most of the books that they are given. Thank you for your thoughtful post, Paul May. There's nothing like personal experience and feelings to make such "absences" visible. Thanks for your post, Paul, and it is a shame that you couldn't find much for your grandson in the bookshops. I know that Tamarind Press has lots more choice, and authors like Odette Eliot write picture books that you might like for your grandson. And I agree that it is often only when you step into soemone else's shoes, (or booties in this case!) that you become aware of what's missing. Thanks for your post. Can I recommend Letterbox Library? They have a fabulous range of books, including imports. But yes it's noticeable that picture books are still sadly so overwhelmingly vanilla. I'd recommend for when he's a little older Leon and Bob by Simon James, one of my favourite ever picture books. Through this post, I felt the need to buy good books, especially for children. It's very meaningful to buy your grandson his first book and sad that you could no longer find some really great books. It's surprising that things haven't moved on. When I was writing educational resources a good fifteen years ago, the illustrations - and the text had to feature a range of children. It's strange that, on the whole, picture books are still overwhelmingly white. It is really good to see your post. Sometimes I feel as if I am "banging on" about something that other people think does not matter. Fortunately Malorie Blackman and Savita Kalhan have highlighted this problem and they are famous enough to be listened to. Some people are so anxious to tell me that "children do not notice colour". But often they DO and there should be books depicting children of all possible colours and backgrounds. We have had difficulty in finding enough books for our beautiful black granddaughter.